Provide comfort for the family of David Woodward with a meaningful gesture of sympathy. 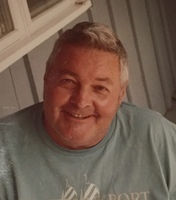 David R. Woodward, 74, formerly of Thomaston, Connecticut and Southern Pines, North Carolina, passed away on January 20, 2019, at Sheriden Woods Health Care Center in Bristol. Born on July 11, 1944, he was the son of the late Kenneth L. and Florence Gangloff Woodward. He attended Morris and Watertown schools, and graduated from Bud Beason’s Oklahoma Farrier’s College in 1972. He began his own business based in Bantam where he had begun a small farm. He worked throughout Connecticut and in neighboring New York and Massachusetts. 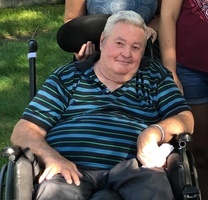 Mr. Woodward moved to Southern Pines, North Carolina, in 1989, where he worked hard to build a new business and became a successful and well-known farrier until an accident on his farm on January 20, 2000 left him a paraplegic and unable to continue in his trade. Not one to give up, he opened a leather repair shop, made horseshoe belt buckles from stainless steel and brass, and designed and made horseshoe-themed jewelry. Mr. Woodward is survived by his daughters, Diana (Kenneth) Stewart and Cheryl (Keith) Stewart, both of Torrington along with his six grandchildren, Matthew and Melissa Stewart, and Kailey, Miranda, and Nataley Stewart and Amber Stewart Stepney, and by his great-grandchildren, Ben and Sophia. Mr. Woodward is also survived by his brother, Kenneth J. Woodward (Cynthia) of Goshen, his three sisters, Barbara Ross, (Lester) of Oklawaha, Florida, Marilyn Mitchell (Henry), of Harwinton, and Janice Smith (David), of Watertown; and also by two aunts, and many nieces, nephews, and cousins. The family would like to thank the multitude of caregivers and nurses who have helped David throughout the years, the doctor, nurses and caregivers, and the social workers at Sheriden Woods, and the Athena Hospice team. Calling hours will be at Rowe Funeral Home, 283 Torrington Road, Litchfield, Connecticut on Saturday, January 26, 2019, from 10 a.m. to 12 p.m., followed immediately by a funeral service at 12 p.m. with a private burial in the spring. To send flowers in memory of David R. Woodward, please visit our Heartfelt Sympathies Store. Sheila Stoddard and Jennie Siloti have sent flowers to the family of David R. Woodward. Guys, I am so sorry for your loss. Dave worked for us for many years. Always a soft spoken quiet man. Sheila Stoddard purchased flowers for the family of David Woodward. Dear David's Family, My late husband and I were friends of Dave's. Doc Leonard (late husband) was also a Farrier. Doc was from Woodbury and I from Newtown, we ended up in Medina, TX. We visited with Dave in N.C. and he with us in TX. I was sorry to hear of his passing, we had good times and fond memories. Sending healing hugs to you All !